As my daughter had a table tennis game at Shimoda junior high school I took her by car in early morning. On the way to our home from the school I found that the sun was rising on the ocean. That sun was shining like a diamond. This is a real nature. This entry was posted in nature on 2008年11月30日 by izusakuraya. The weather forcast tell us the weather correctly recently. It had been warm until yesterday but it was changed and became very cold today. I took this photo at the top of mountain behind Pension Sakuraya. We can get a view of all of Shirahama beach, Izu Oshima island and Amagi mountains from here. 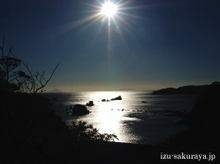 This entry was posted in nature, Sea on 2008年11月19日 by izusakuraya. In these days I go to the school with my dauter for walking. 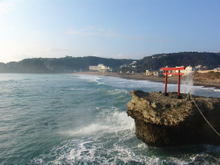 This morning I went to the rock behind Shirahama shrine. There is a red gate called "Torii" on it. This is a good point to take photos with the ocean and sunrise. 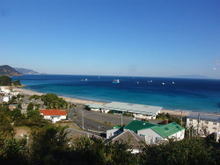 This entry was posted in beach on 2008年11月17日 by izusakuraya.